The Montgomery Bus Boycott was one of the major events in the Civil Rights Movement in the United States. It signaled that a peaceful protest could result in the changing of laws to protect the equal rights of all people regardless of race. Before 1955, segregation between the races was common in the south. This meant that public areas such as schools, rest rooms, water fountains, and restaurants had separate areas for black people and white people. This was also true of public transportation such as buses and trains. There were areas where black people could sit and other areas where white people could sit. On December 1, 1955 Rosa Parks was taking the bus home from work in Montgomery, Alabama. She was already sitting down and was in the row closest to the front for black people. When the bus began to fill up, the driver told the people in Rosa's row to move back in order to make room for a white passenger. Rosa was tired of being treated like a second class person. She refused to move. Rosa was then arrested and fined $10. 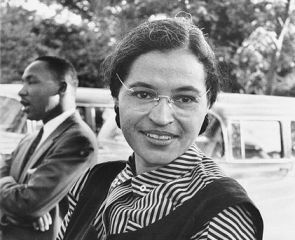 Although other people had been arrested for similar infractions, it was Rosa's arrest that sparked a protest against segregation. Civil rights leaders and ministers got together to organize a day to boycott the buses. That meant that for one day black people would not ride the buses. They picked December 5th. They handed out pamphlets so people would know what to do and on December 5th around 90% of black people in Montgomery did not ride the buses. The boycott was planned at a meeting in Martin Luther King, Jr.'s church. They formed a group called the Montgomery Improvement Association with Martin Luther King, Jr. as the leader. After the first day of the boycott, the group voted to continue the boycott. King made a speech about the boycott where he said "If we are wrong, the Supreme Court is wrong, …the Constitution is wrong, ....God Almighty is wrong." In order to get to work, black people carpooled, walked, rode bicycles, and used horse-drawn buggies. Black taxi drivers lowered their fares to ten cents, which was the same price as a bus fare. Despite not riding the bus, black people found ways to travel by organizing and working together. Some white people were not happy with the boycott. The government got involved by fining taxi drivers who did not charge at least 45 cents for a ride. They also indicted many of the leaders on the grounds that they were interfering with a business. Martin Luther King Jr. was ordered to pay a $500 fine. He ended up getting arrested and spent two weeks in jail. Some of the white citizens turned to violence. They firebombed Martin Luther King Jr.'s home as well as several black churches. Sometimes the boycotters were attacked while walking. Despite this, King was adamant that the protests remain non-violent. In a speech to some angry protesters he said "We must love our white brothers, no matter what they do to us." The boycott lasted for over a year. It finally ended on December 20, 1956 after 381 days. The Montgomery Bus Boycott brought the subject of racial segregation to the forefront of American politics. A lawsuit was filed against the racial segregation laws. On June 4, 1956 the laws were determined unconstitutional. 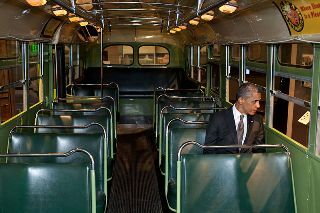 The boycott had worked in that black people were now allowed to sit wherever they wanted to on the bus. In addition, the boycott had created a new leader for the civil rights movement in Martin Luther King, Jr.
One of the first leaders of the boycott was Jo Ann Robinson who stayed up all night after Rosa was arrested and made copies of a flyer to hand out about the boycott. E.D. Dixon was president of the local NAACP at the time. He helped to select Martin Luther King, Jr. as the leader of the boycott. Local car insurers stopped insuring cars that participated in the boycott's carpools. Black churches across the country donated shoes to the boycotters who were wearing out their shoes walking. The Supreme Court held up the ruling that segregation was unconstitutional.